Aspire just launched the new Speeder 200W kit including Speeder mod and Athos tank. It looks fantastic, but how’s its performance? Today I will review the Athos tank in brief, let’s check it out together! The Athos is very nice in appearance; there is a tapered clear drip tip and an extra, wider bore, Delrin drip tip, similar to a ‘chuff cap’ for different needs. 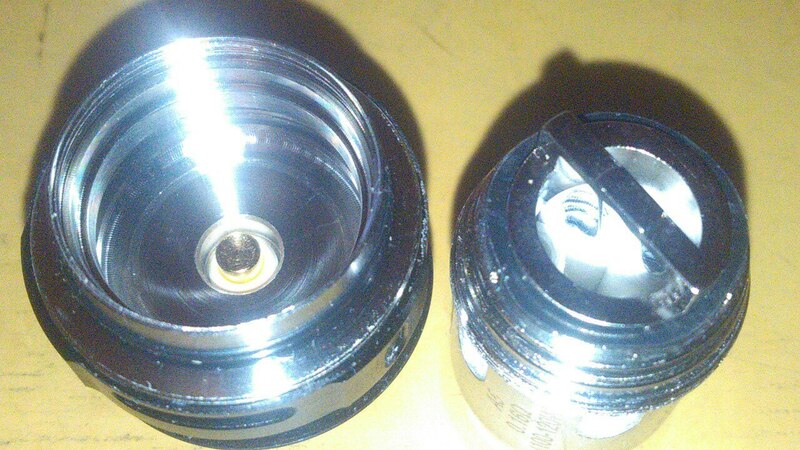 The whole structure is very simple, it’s very easy to change the coil and clean the tank. There is a nice knurling design both on top cap and adjustable airflow ring, so you can easily grip and unscrew the top cap to fill or adjust the airflow. The Aspire Athos tank features easy top-filling, with a very adequate fill port, big enough to drip or drop e-liquid into it without any mess. The Aspire Athos uses an all new coil design, the Tri-coil head, (three cores) is rated at 0.3Ω and the recommended power setting is 60-75 watts, while the Penta-coil head (five cores) rated at 0.16 Ω with a recommended power setting of 100-120 watts. Many people want to know how it compares to our Cleito tank, I’ll tell you, the Athos is somewhat different to the Cleito, more like our Cleito120 but with the benefit of a more powerful output and greater airflow (you can imagine the difference between single coil and multi-coil set-up). It’s a bit unfortunate for sub-ohm vapers in TPD regulated countries’, but don’t worry, Aspire has you covered. In order to meet TPD requirements, The Aspire Athos has 2ml and 4ml options. As you can see in the picture below, the 2ml and 4ml versions uses same base hardware, same coil, same top cap and drip tip, so to switch back to a 4ml version, you just need to change the glass and metal protective tube, then you will be able to have a 4ml version, lol. don’t let the TPD regulators know! @Tina I was looking at the help guide and in the Q&A under the "Low Res" section it incorrectly states the lowest coil supported is 1.0 Ohms. Probably just a typo. I think that inasmuch as the equipment that we vapers use now in 2017 is so for advanced in comparison to what we started with years ago (Nautilis,Atlantis,BVC,BDC & variations) that is way past time for all manufacturers to clearly print the material used to build the atomizer coil... both on the coil itself and package. There is a large part of our vaping community that prefer temperature control over simple power mode. Aspire... you've made temperature control coils for other atomizers for years... Most of today's TC vapers use SS 316L for their coils. As I'm sure that you are well aware, SS 316L can be used in either TC mode or Power mode. SS 316L can be coiled in whatever design you wish, parallel,Clapton,Alien,etc. I'm sure that your engineers are more than capable of designing SS 316L coils to meet whatever specifications that you need. It may be marginally more expensive than Kanthal, but it's across the board utility more than makes up for that. TIME TO SWITCH ALL OF YOUR COIL PRODUCTION OVER TO SS 316L! Way past time actually.... I am a long term customer and could fill a good sized box with all of the Aspire atomizers, mods and hundreds of coils , rba's etc that I've bought over the years. DO THE RIGHT THING! Are Athos coils compatible with TFV coils? Can I expect the appearance of an RBA database? Why do you come up with some incomprehensible driptips? There must be an insulator here? @JAW No, there is not. Screw the resistance on the base and look through one of the airholes, you will see that there is about 1mm gap between the horizontal bar of the resistance and the bottom of the base. There is however contact between the little protuberance in the middle of the bar and the center pin.